The Lady Cassandra Swarovski earrings feature flowers made of Swarovski white pearls suspended from twisted beaded spirals. 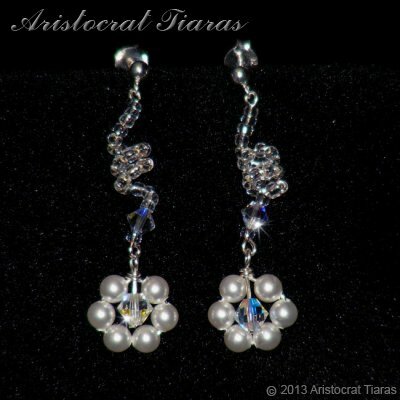 If you are looking for floral themed jewellery to compliment a flowery wedding dress, these crystal earrings from Aristocrat Tiaras are ideal for you. You may aslo be interested in Lady Petunia flowers necklace or Princess Aurora tiara from our bridal tiara collection.